Chelsea boss Maurizio Sarri believes England international Callum Hudson-Odoi will stay with the club - and can become one of Europe's leading players. The 18-year-old started for England in Montenegro on Monday but is yet to begin a league match for his club. He has been linked with Bayern Munich and in the last week more European clubs have shown interest. "I'm not able to say he's going to sign a contract, but I think he'll stay here with us in every case," Sarri said. 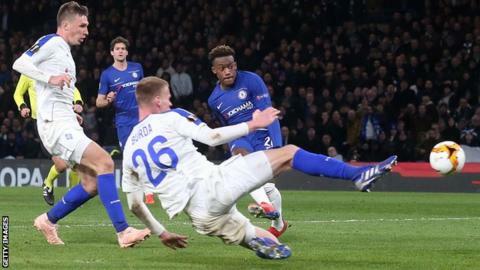 Hudson-Odoi made his senior Chelsea debut in an FA Cup tie against Newcastle in January 2018 and made a total of four substitute appearances last term. The academy graduate started the curtain-raising Community Shield match against Manchester City in August but his club appearances have been mainly restricted to the Europa League and domestic cup competitions this season. He has made 19 appearances this season, including starting four of the team's eight Europa League matches, two FA Cup ties and one League Cup fixture. Sarri believes the teenager's development is being managed correctly. "In the last season, Callum was only 17 and he played three or four matches. In this season, he is really very young - only 18 - but, at the moment, he has played for 19 or 20 matches. I think the evolution is the right evolution. "Probably, he will play 30-35 matches in the next season and so I think that, with Callum, we are on the right path. "He can become, I think, one of the most important players in Europe. "Of course he is very young. But I think that he is really very strong. The character is really very strong." Sarri admitted that he only watched 20 minutes of his winger's full international debut as England came from a goal down to beat Montenegro 5-1, adding: "I had 14 players in the national teams - I had no time to watch 20 matches. "Callum didn't start very well in the first 20 minutes on the right. He did very well on the left immediately but I know him very well, and I know he prefers to play on the left."